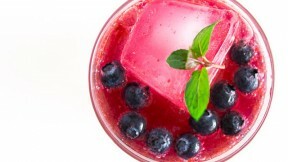 Follow Marc Matsumoto's simple recipe for blueberry lemonade that is perfect for those spring and summer months. You can also add your favorite spirit for a cocktail. Read Marc's suggestions in a full post on the Fresh Tastes blog. Put the sugar, lemon juice, lemon zest and blueberries in a blender or food processor. Blitz until the mixture is smooth. If you want your lemonade to be pulp-free, strain the mixture through a tea strainer, otherwise pour the mixture into a 2-quart pitcher. Add the water, and stir to combine. Fill the pitcher with ice and serve.